At five o’clock in the morning on May 16, 1940 a company of the 8th Panzer Regiment lay in an ambush position along a rubble-strewn street of the French town of Stonne. 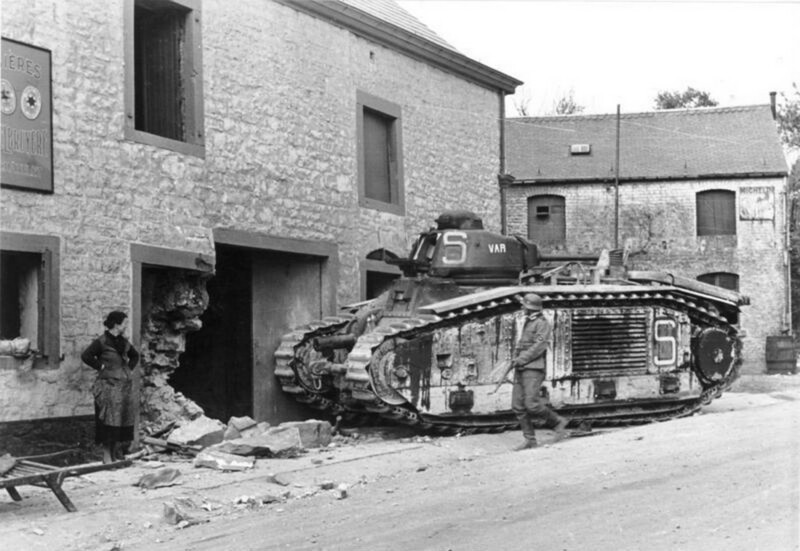 The day before, the unfortunate village had changed hands several times as French troops attempted to stem the tide of German armor headed toward the English channel, threatening to trap Allied forces in Belgium. Three squadrons of Stuka dive bombers ravaged Stonne, as well as both French and German artillery. That morning, the Panzer IIIEs and IVDs—then the best tanks in German service—deployed to stave off a French counterattack. Suddenly, a squat green tank lumbered around a street block directly before of the German unit. 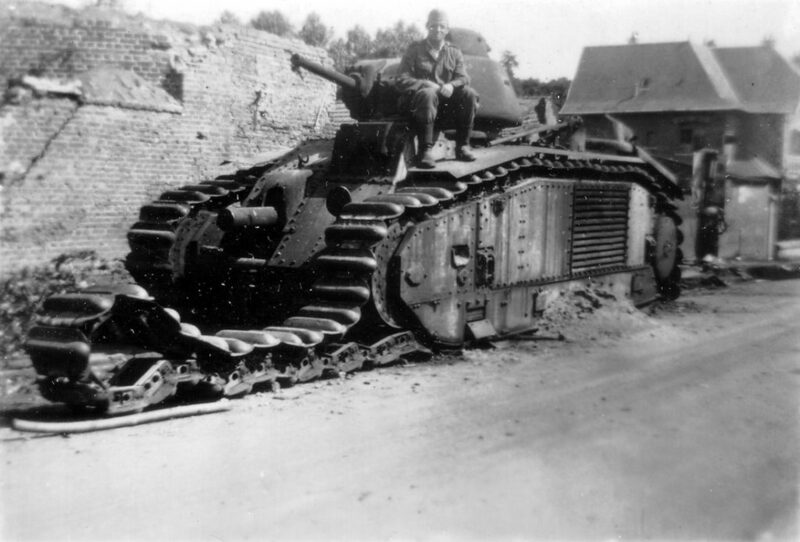 This was Eure, a 31.5-ton Char B1 bis tank commanded by Capt. Pierre Billotte. His driver, Sergeant Durupt, triggered the 75-millimeter howitzer fixed in the front hull roared, smashing the Panzer III to the rear of the column. At the same time, Billotte swiveled the smaller 47-millimeter high velocity cannon in the turret and picked off the lead tank—a mere 30 meters away. The wrecks trapped the Panzer company in a head-to-head confrontation with the Gaelic behemoth. 37-millimeter rounds cracked from the long barrels of Panzer III tanks and ricocheted off Eure’s turret. Low-velocity 75-millimeter shells made basso thuds as they spat out the stubby guns of Panzer IV tanks, only to shatter in clouds of shrapnel against the French tank’s glacis. More than 140 shells cratered Eure’s armor—but none penetrated. Billotte coolly blasted one Panzer after another. Once he had destroyed the entire company—11 Panzer IIIs and two Panzer IVs in all—Billotte continued his advance and added two 37-millimeter anti-tank guns to the tally. By 7:00 A.M., Stonne was back under French control and would remain so for the rest of the day. The same day, the tank Riquewhir would charge into a column of enemy infantry, its blood-stained tracks causing the German 64th Schutzen Regiment to panic and flee an entire sector of Stonne. For the first time, the Wehrmacht had encountered a tank that completely that outmatched its own. France will of course go down in history for being defeated by tanks in World War II, but it was not due to lacking tanks—the French army fielded nearly 4,000 tanks of more than a dozen different types, most of them well-armored. Rather, poor organization, confused doctrine and disastrous operational conduct defeated the French military. The Char B1 was conceived only a few years after World War I as an infantry support tank with a heavy assault role. The “battle tank” would tackle enemy fortifications, artillery and tanks head-on, prevailing through superior firepower and armor. The slow heavies would punch holes allowing faster “cavalry tanks” to penetrate behind enemy lines. The resulting design revealed its World War I-era pedigree with huge tracks as tall as the hull intended to ford trenches with ease—as well as its multiple cannon armament. A heavy 75-millimeter howitzer was fixed with only vertical traverse in the hull for blasting pillboxes. It was operated by the driver via a sophisticated Naeder hydraulic system for precise aiming, and serviced by a loader. Additionally, a small turret on top mounted a 47-millimeter gun for hunting tanks. There were also machine guns in the turret and hull for close defense against infantry. It took nearly a decade and a half before the first B1 was ready to enter production in 1937. A short initial run of 35 Char B1s was quickly superseded by the B1 bis model, with higher-velocity SA35 47-millimeter gun for busting enemy tanks and a 300-horsepower engine. Most notably, the B1 bis boasted 55 to 60 millimeters of armor on all sides, leaving it virtually without major weak points. For comparison, the Panzer III and IV had only 20 to 35 millimeters of armor. Despite completely overmatching its peers in firepower and armor, the B1 had major flaws. It could only achieve a maximum speed of 17 miles per hour while contemporaries typically averaged 25 miles per hour. The B1’s range of 110 miles wasn’t actually worse than that of German medium tanks, but it required tons more fuel. The French army even experimented with having the B1s tow extra fuel supplies in a trailer, then decided to rely on fuel trucks, which were vulnerable and in short supply. The B1 also suffered from the one-man turret endemic to French tanks. A B1’s commander had to give verbal commands to his crew and possibly the other tanks in his unit, aim and fire the 47-millimeter gun in the turret and reload the gun. It was simply too much do efficiently. Even though the turret gun could theoretically fire up to 15 rounds a minute, a rate of fire of four rounds per minutes was more typical. A final weakness of the Char B1 was its rudimentary ER53 radio, through which the operator could only transmit simple commands via Morse code! Even though an audio receiving model later became available, it was considered inferior because it was drowned out by the roar of the engine. By contrast, German Panzers all had excellent radio communications, affording commanders much finer tactical and operational control. At least 369 B1 Bis were manufactured by Renault and four additional French companies. Each was individually named after a French city, colony or even wine. They were not cheap — 1.5 million francs each, four or five times the cost of a light tank. Three B1 ter prototypes were also constructed with five-man crews, 70-millimeters armor plates and 350-horsepower engines, but the Third Republic fell before they could enter production. France entered World War II with only four battle tank battalions, or BCCs, each with 33 B1 tanks. By the time major ground operations began in May 1940, two BCCs each served in three reserve armored divisions, or DCRs, that were intended to support the infantry. A fourth DCR was hastily formed under command of Gen. De Gaulle, as well as five independent companies for supporting infantry formations. Unfortunately, the DCRs were gravely lacking in logistical and repair services, a weakness compounded fatally by the Char B1’s high fuel consumption and frequent breakdowns. 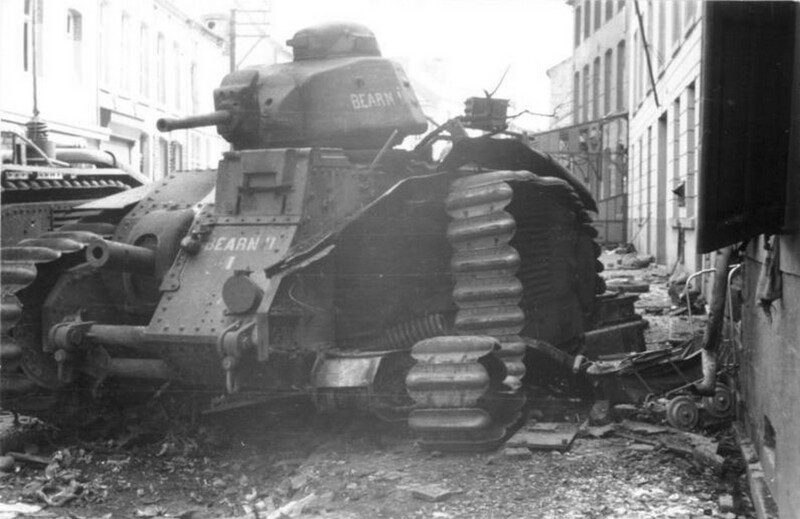 As air strikes and armored columns caused the French logistical system to collapse, more Char B1s were abandoned for lack of fuel or necessary repairs than were destroyed in combat. The DCRs’ infantry regiments also lacked motorized transport to keep up with the tanks. Invariably, the B1s roamed ahead into battle without infantry support. Nonetheless, the B1s were very tough—flat-out invulnerable to the 20-milimeter gun on the Wehrmacht’s most numerous tank, the Panzer II. Panzer III, 38t and IV tanks only had a slim chance of penetrating at ranges under 100 meters. All were easily destroyed by both of the B1’s cannons. Only 88-millimeter flak guns could reliably take out a B1. For example, Jeanne d’Arc continued running despite being struck by 90 shells and losing both of her main guns, before finally being dispatched by a flak gun. 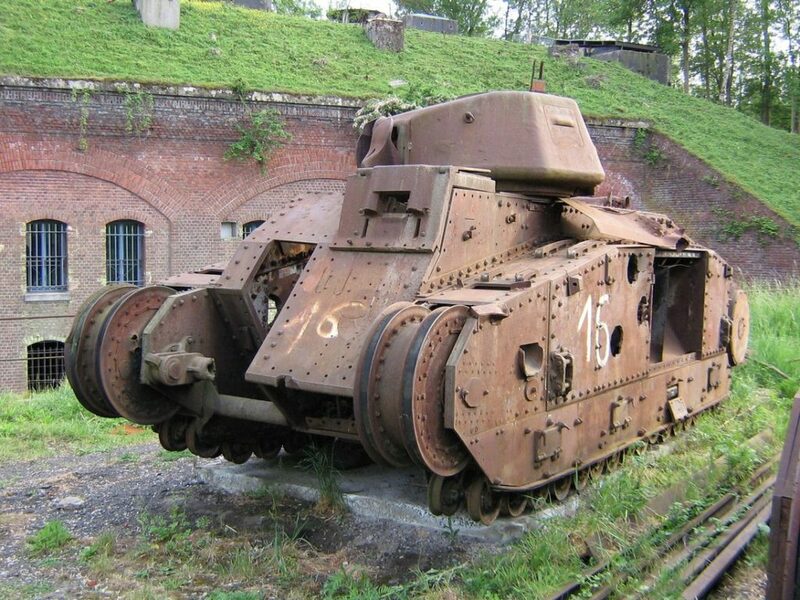 The French tanks occasionally were disabled by smaller guns. In the first day of the battle for Stonne, a Panzer IV knocked out the B1s Gaillac and Hautvillier, while an anti-tank gun destroyed Chinon with a hit aimed at the side armor. Billotte’s unit, the 3rd DCR, was eventually deployed elsewhere, and Stonne fell to German forces on May 19 after changing hands 17 times. However, a concurrent French counterattack in Flavion, Belgium better illustrates how the near-impenetrable armor, superior firepower and bravery and determination of the French tankers could not makeup for failures in logistics and combined-arms coordination. On May 15, the 62 Char B1s and 80 H39 light tanks of the 1st DCR rolled forward to block the advance of more than 546 tanks of the 5th and 7th Panzer Divisions, the latter commanded by Erwin Rommel. The lopsided numbers were typical of the German superiority at concentrating their armored forces to decisive effect. The B1s deployed to battle at 8:00 A.M. short on fuel, many of their supply trucks already lost due to air attacks. Just 26 tanks of the 28th BCC rolled forward to block the 7th’s path. Four had already broken down. From atop a hill, they began picking off swarming Panzer IV and 38t tanks. The German armor charged, closing within 100 meters, only to be scourged by 47- and 75-millimeter shells. Sousse took out seven tanks, Phillipeville six and other tanks averaging three each. In return, only a single B1 was knocked out and another damaged. The Panzers retreated. Rommel then committed a Panzer regiment to a flanking attack which was countered by a company of B1s—some of which ran out of fuel in the process, forcing them to manually rotate their turrets. Three immobilized B1s were swarmed by a dozen German tanks each, their armor scoured by small-caliber shells until the crews were forced to bail. But the German probe turned back. Rommel then called in artillery and dive-bomber strikes on the hill. His Panzer IVs had exhausted their 75-millimeter shells to little effect on the B1s’ heavy armor. Around noon, the 37th BCC dispatched its 2nd company to roll to the assistance of the 28th, but fuel shortages and mechanical breakdowns reduced the unit to only five running tanks when they were ambushed by anti-tank guns and 30 Panzer IIIs and IVs hiding in the Biere l’Abbé woods. The vastly outnumbered heavy tanks took out 15 Panzers, but three B1s succumbed to the sheer weight of incoming fire. The remaining Guynemere, Ourcq and Isere retreated, heavily damaged. The other two companies of the 28th began to withdraw. While the 1st company got out cleanly, the 3rd bumped into a battalion of powerful 88-millimeter Flak guns and 105-millimeter howitzers near Denée. After losing all but seven of his B1s, Lehoux ordered his company to charge, even though he lacked infantry and artillery support. The heavy guns wiped out the French tanks—but not before the French crushed several 37-millimeter guns under their treads, and destroyed eight of the German flak and field pieces with direct fire. Back at Flavion, the 37th BCC single-handedly continued to hold up an entire Panzer division. Growing desperate, Rommel deployed 88-millimeter flak guns a kilometer away. These begin picking off the fuel-starved French tanks, which could barely move to fire back with their hull-mounted howitzers. A final charge by the Panzers caused the signal to retreat to be sounded at 6:00 P.M. Between the lack of fuel, mechanical breakdowns and enemy fire, only three of the battalion’s B1s escaped. Though a battalion and a half of French tanks had knocked out roughly 100 Panzers, a failure to support their actions with artillery, infantry and air support meant the tankers’ sacrifice had been in vain. But such actions could not shift the overwhelming tide of events. The lumbering Char B1 didn’t really suit the Heer’s style of high-speed armored warfare. However, a victorious Germany decided to employ more than 161 captured Char B1s, overhauled and designated Panzerkampfwagen B2 740(f), in more static roles. Some were used in the invasion of Russia. Others fought huge partisan armies in the Balkans. Panzer Battalion 213 was even deployed to the Channels Islands that Germany captured from England. Under personal consultation of Hitler, the German military and tank manufactures tinkered with the French tanks. Sixty B1s had their hull-mounted howitzers replaced with flamethrowers on flexible mounts. These first saw action in the 102nd Flame-tank Battalion as part of Operation Barbarossa, assaulting Soviet border fortifications in Western Ukraine on June 1941. Two of the tanks were knocked out, however, and the unit suffered so many breakdowns that it was withdrawn from action in July. The Germans busily went about redesigning the flame tanks, and deployed an upgraded design in the 223rd Captured Tank Company to the siege of Sevastopol in the summer of 1942, again with little success. Another 16 B1s had their turret ripped off, and replaced with 105-millimeter howitzers enclosed with an armored cab to serve as self-propelled artillery. These served in the 93rd Artillery Regiment in the garrisons of occupied France and then Sardinia. In June 1944, American and British troops encountered B1s in Cherbourg during the battle of Normandy, then again in Arnhem and Oosterbeek in Holland during Operation Market Garden. By this late stage in the war, Sherman tanks and bazookas easily outgunned the early war design. Still, the B1 could still dish out quite a bit of anti-personnel firepower and the Germans still had 40 in service entering 1945. French resistance fighters managed to get their hands on a handful of the abandoned heavy tanks and used them in the liberation of Paris. While the front-line units of the Free French Army under DeGaulle primarily used U.S. armor such as M10 tank destroyers, they still rounded up 19 Char B1s they found in Renault factories and assigned them to 2nd Squadron of the 13th Dragoon Regiment. The Dragoons were dispatched to assist in the siege of the last fortified pockets of German forces in Royan and La Rochelle. Facing limited anti-tank defenses, the Free French Chars blasted German pillboxes in Saint-George de Didonne, which surrendered on April 1945, and then besieged the German garrison at La Rochelle. The French heavy tanks were finally retired in 1946. A final two Char B1s were modified as minesweepers in April 1945. They contributed to cleaning up the terrible mess of a war, that for all their formerly impermeable armor, they could not win by themselves.